Stars are spherical (round) objects in space that radiate energy from their hot cores (centers). 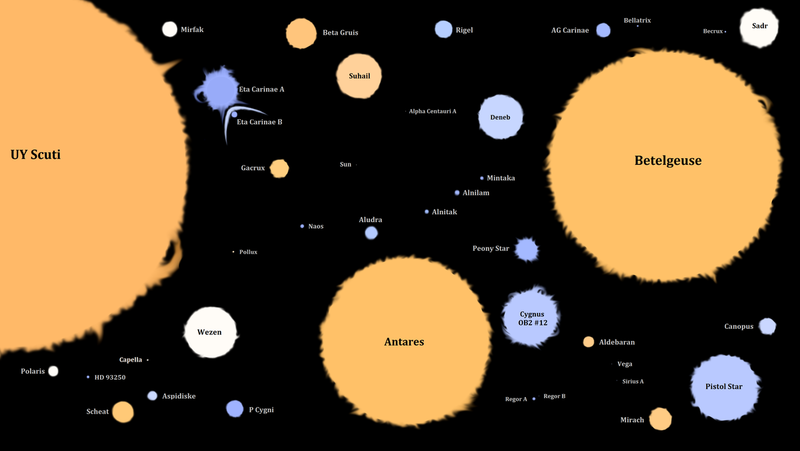 They outnumber by far all other celestial bodies (planets, moons, comets, and others) in the universe. Stars have a life span (like humans do, only much longer). They are formed in clouds of gas and dust. 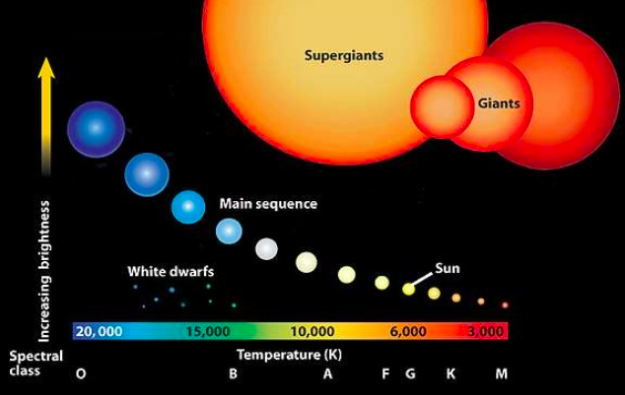 How long a star lives depends on its mass (how much matter is in it). Are all stars the same? Are they Different? Ideas on either? If a star has a lifespan; how long will it live? How do you know how old it is? Or when will it die? Your predictions should be recorded in your individual Google document, Space Exploration – Stars. Space is not empty, but filled with interstellar matter which is made up of gas (mainly hydrogen) and dust. Even though only 1% of all interstellar matter is dust , it is the dust that makes it hard for astronomers to see light from distant stars. Stars begin to form from the materials in a nebula, a vast cloud of dust and gas that grows until it finally collapses in on itself. It is thought that this collapse is caused by gravity. An early phase of star, called a protostar, is created. If the protostar collects enough dust and gas, its core will reach 10 000 000 ºC and the atoms start to fuse together. The process of hydrogen atoms joining to form helium atoms is called nuclear fusion. Nuclear fusion creates an enormous amount of energy. It is the energy given off by fusion that causes stars to glow. Similar to all living things, stars age. They all start in a nebula, but the path of development differs depending on the mass of the newborn star. There are three possible paths of development for a star. These stars start out small and remain that way for most of their life as dim to cool red dwarfs. Red dwarfs burn their hydrogen at a much slower rate and may last for 100 billion years. These stars are similar in mass to our Sun. They burn their hydrogen faster than low mass stars. They last about 10 billion years. They will eventually expand into a red giant, then they collapse into a small, dim white dwarf. As it cools, it turns into a black dwarf, a dense, dark body of mostly carbon and oxygen. These stars have 12 times the mass of our Sun. They expand and burn their gases rapidly becoming red giants. Their life span is about 7 billion years. They have a violent ending collapsing onto themselves with a massive explosion called a supernova. When these supernovas explode they send heavy elements into space. The carbon, oxygen, and hydrogen we use on earth comes from these supernovas exploding. When a star more than 25 times more massive than our Sun explodes into a supernova, it becomes a black hole and collapses into itself. Because the material is so dense and has an extraordinary amount of gravitational pull, nothing can escape its force, not even light. For this reason black holes are considered "black". In the image below, you are able to identify 4 components of a black hole. 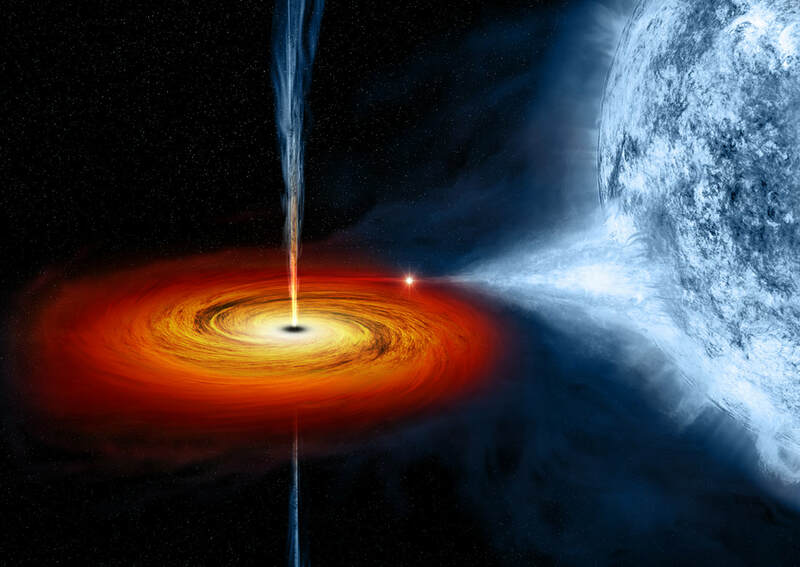 The star is being drawn into the black hole and jets of material are shooting out of the center. Many stars visible from Earth are much larger that our Sun. Nearly 100 years ago, two astronomers began studying data from large numbers of stars that were visible from Earth. Hertzsprung in Holland and Russell in the United States. They both drew the same conclusion from their examination of the stars, both concluded that stars do not stay the same forever. Rather, they follow a clear pattern of evolutionary developmental stages. Their results were brought together in the Hertzsprung-Russell diagram. The data they collected and analyzed was able to demonstrate the relationship between a star’s luminosity, or brightness, and its temperature. Luminosity is the amount of energy it releases. 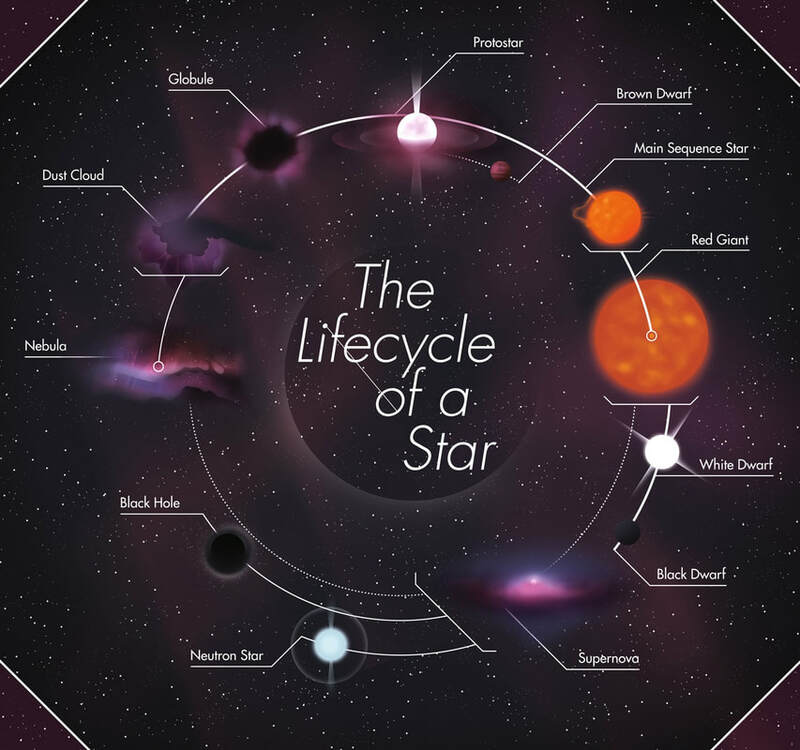 The central band of stars on the diagram marks the “main sequence” stars. Astronomers estimate that about 90 percent of all stars are in this phase. These are the stars whose energy comes from converting hydrogen to helium. When these stars age and start to run out of hydrogen, they begin to expand and undergo changes in temperature, colour, and luminosity. Older stars are the ones no longer on the main sequence band. This change signals the final stages of a star’s life. Spectroscopes are used to analyze chemical composition. Using a spectroscope, the light emitting from a star reveals spectral bands that show certain gases in the star. Looking at the spectrum (pattern of colours - think ROYGBIV, the colours of the rainbow) astronomers are able to determine what the star is made of and what the temperature of the star it. 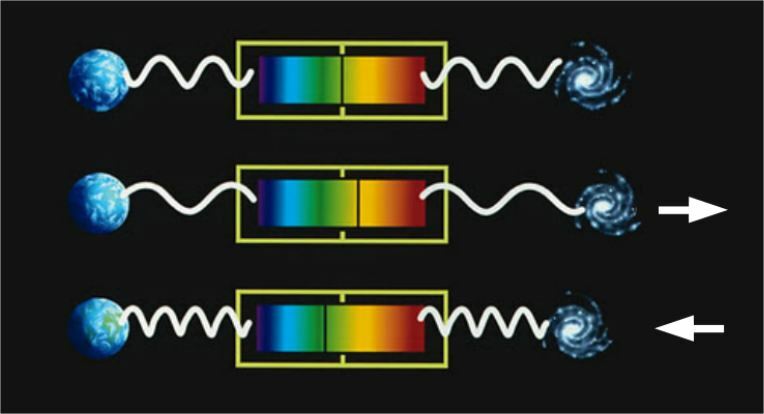 Scientists use something called the “Doppler Effect” which measures changes in wavelength because of motion. Changes in sound waves can also be detected. When waves are analyzed it shows whether the pattern of light is being compressed or extended. If a star is coming closer toward Earth, the wavelengths of light become compressed. The Doppler Effect (the same effect that makes a car's sound change as it passes you) is used to determine a star's motion. When a star is moving away from Earth, the wavelength appears longer, so the colour appears more red than expected. This is called a red shift. Similarly, using the Doppler Effect, when a star is moving towards Earth, the wavelength appears shorter, so the colour appear more blue than expected. This is referred to as a blue shift. Astronomers discovered that the most distant stars are the reddest. This lead to the conclusion that the universe is expanding. If the universe is expanding, then it is likely that sometime in the past: All stars and the planets started out in the same place, clustered together. A name for this is singularity. Also known as, the Big Bang Theory, which states that the universe started with singularity, that there was a massive explosion, and that the events that have occurred since then are all results of that first event. Let's have a check in. Take the time to answer the questions provided to you; record your answers on the worksheet provided. (You should be able to answer the questions without having to refer to your notes). Return to "Separated By Vast Distances"
Proceed to "The Sun and Its Planetary System"